Today's travel flashback is Christmas 2005. 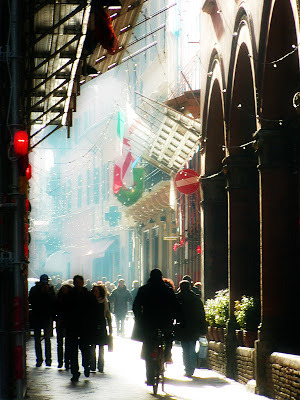 I was living in northern Italy for the year and unable to go home for Christmas. I spent the Christmas holidays going back and forth between Torino and Bologna, Lake Lugano in Switzerland, Nice and Istanbul. Although I prefer Christmas at home-- the holidays spent working and living in Europe had a very special magic all to their own. Italy and France celebrate the holidays with a spectacle of lights that are unprecedented. The lack of overt consumerism was also a very refreshing and welcome change for this Christmastime spent abroad. I can only imagine how refreshing it must be to be away from so much impersonal consumerism - it isn't easy to avoid it here anymore. It's a cool picture t.r. sorry you were not able to home for the holidays. How is Istanbul? We planning to go there this year. TR, thanks for stopping by. I only have a moment here but I too will return. This is a great photo ... I see more as I scroll down. You're quite the traveller -- see you again after the weekend! I spent Christmas in Florence and Rome- you're right, it's lovely there during the holidays. Frosty nights with street musicians playing and roasted chestnuts for sale, the museums nearly empty of tourists, the cafes warm and cozy. I say that's the best time of year to travel. It was 2005, too. Maybe we crossed paths!